Killer Characters: I'm On A Break! Samantha Kidd here. I know I shouldn't be here. 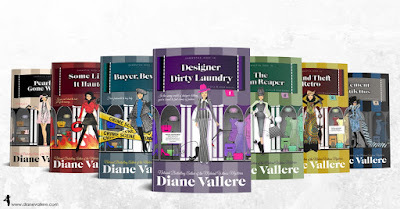 I should be in the pages of the book Diane Vallere is writing about me right now. She's at the Los Feliz branch of the Los Angeles Public Library where she writes from time to time. It's her go-to writing location when she needs to buckle down and get my (or Madison Night, or Poly Monroe, or Margo Tamblyn, or Sylvia Stryker)'s story written. Let's just say, when Diane goes to the library to write, she means business. Of course, I'm not cooperating. Can I be honest for a moment? My background is in fashion. I was a buyer. In my first seven books, I had some close calls but I had some great outfits. Would you look at me now? I'M IN A ROBE! That's right. Diane didn't even get me dressed yet. How am I supposed to have the confidence needed to attend the intimate apparel trade shows (that's where she's sending me this time) where I'll be surrounded by models in their underwear, when I'm not even dressed? I mean, why would she do that to me??? I bet you wouldn't cooperate either! Guess what? She gave it to me. She said, "I will give you Thursday and Friday to start telling me a new story. If it is engaging enough, I will abandon the story I wanted you to tell me and chase the new one." (Yes, she said it out loud, but nobody was around to hear because I'm a fictional character and she generally doesn't talk to me out loud when people are around. Would you?) So for the past fifteen days, she's been writing about my new story. So far, so good. I can't tell you much, because I can't control what she cuts in the editing process, but you should definitely stay tuned, because, let's just say, in this story, more than one series character gets exposed. And there's the Eiffel Tower. Oh, wait, she just gave me a dirty look so maybe I wasn't supposed to tell you that part. 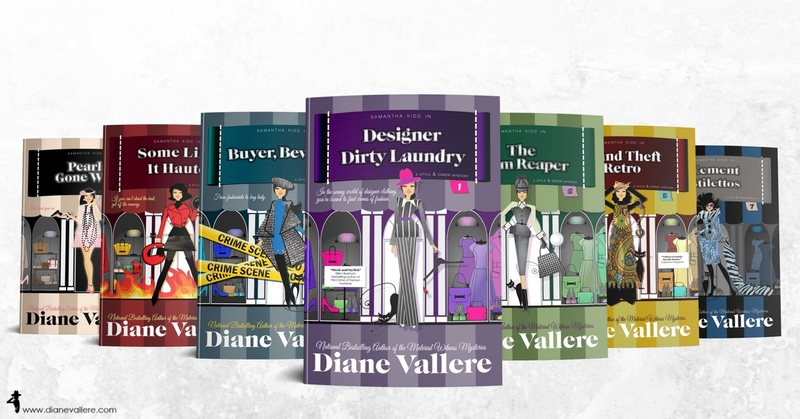 And since it's Library Love at Killer Characters, Diane wants you to nominate YOUR favorite library in the comments below. One lucky library will receive a Library Love Gift Pack from her including books, bookmarks, and a guide to all of her series! (and maybe even a How To Live Like Samantha poster if I have anything to say about it.) (I probably don't.) Libraries Rule! I nominate the Fairborn Ohio branch of the Greene County Public Library system. Fretz Park Library in Dallas, Texas. They have the most helpful and friendly staff who remember you and the kinds of books you like to read. They set up wonderful book displays and have a display case dedicated to customers collections. I love this library! The Neill Public Library here in Pullman, WA is small, but well loved by our community. It’s also the spot for our book clubs, sewing and knitting groups to meet in one of the conference rooms. What I love most though is its comfy atmosphere: its children’s area is bright colors and comfy cushions to sit on, and the library not only puts up book promo spots, but also highlights local artist’s photography, paintings and quilts on their walls. Oh, and Samantha, tell Diane the gal (or guy) whose library is chosen would probably love a poster for themselves... I know I would! The Sumner branch of Pierce County Library. It is well used and gets lots of traffic in this small town. Lots of great education events and community outreach. Great staff and fun is had by all who come in! Thanks for the chance to win! My favorite library is the Tigard Public Library in Tigard, OR. My nomination The Pima County Public Library in Pima County, AZ. Diane & Samantha, I would be honored if you would grace my library. Plum Library. Plum, PA.